My daughter, Mims, is a fancy little girl. She's a girly-girl that is obsessed with frilly dresses and will do any chore, no matter how horrible, if I will let her wear lip gloss. She one time cried in Target when I tried to buy her a Batman shirt, because it wasn't pretty enough. My girl is so into my crocheting. 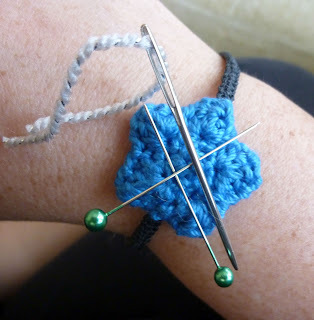 She would like to learn, but she's just too little to get both of her hands to do what they need to do to crochet. So, instead, she sits on my lap and watches me. She constantly asks if the piece I'm working on is for her. She declares that everything I make is "So cute, Mama!" 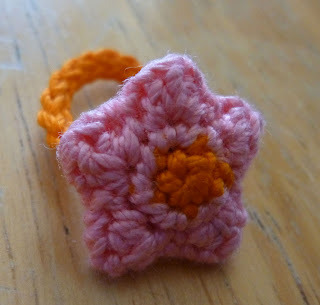 For my sweet little girl, I made a Star Ring. I crocheted a Wishing Star out of size 10 crochet thread and used a size 8 steel hook. 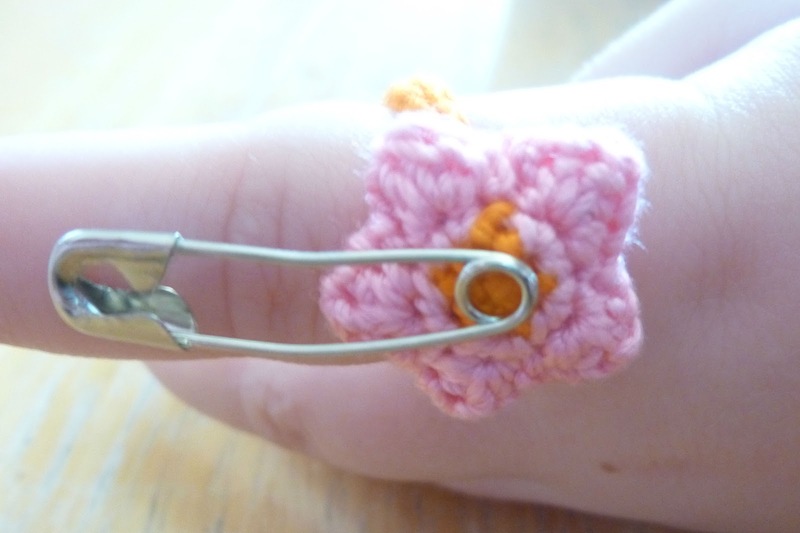 The ring band was made by chaining 20 stitiches, joining the ends of the chain with a slip stitch, and then making a second row of single crochet in the back of the chain loops. Easy peasy! I just stitched the ring band on to the back of the star to make the cute ring. But wait! This is no ordinary ring! This is a ring with super powers! Just like my Mims, it looks sweet and girly on the outside, but inside it's filled with magic!!! Did I say magic?! I meant a magnet! I slipped one of those super tiny neo magnets inside the star before I sewed it up. Mims has these toys that are activated by magnets, so I thought it would be funny if she could use her 'super powers' to activate them as well! 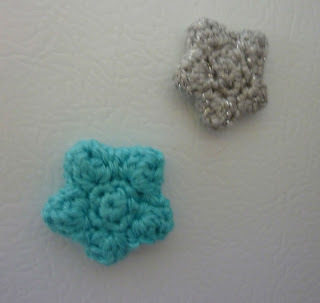 The magnets came in a four-pack, so I made some stars for our fridge. 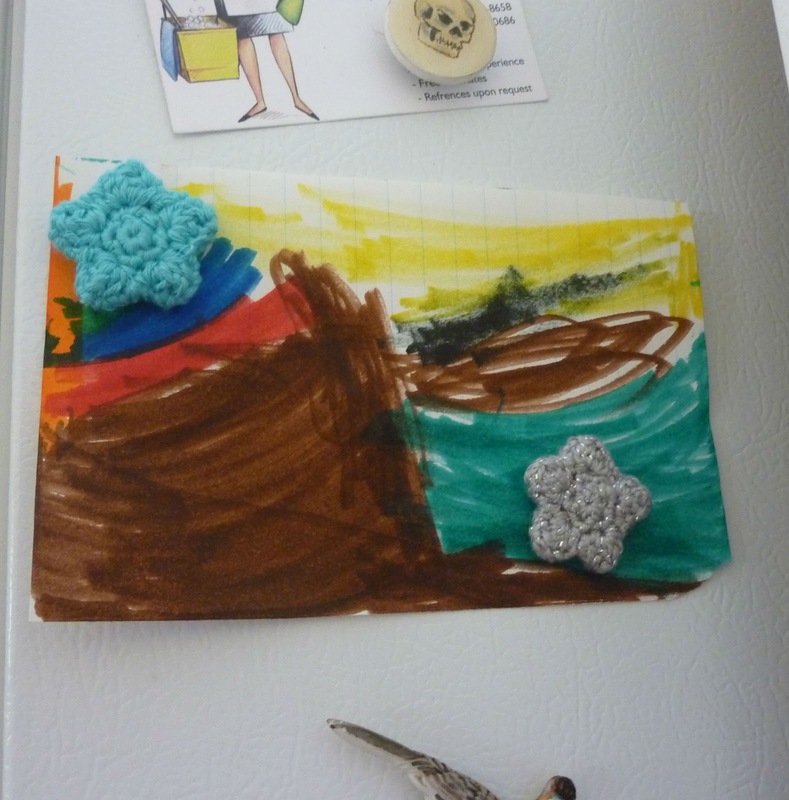 I think if I ordered really good magnets on Amazon it probably wouldn't take two of them to hold up Mims's picture. That's what I get for buying the cheapies at Walmart. Okay, so this is my fave! 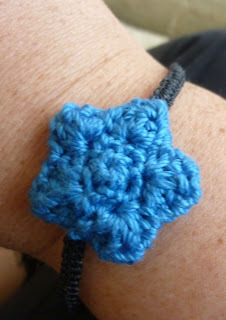 I made a magnetic star bracelet for myself. Not because of any magical healing properties, or anything like that, but because sometimes it's helpful to have a magnet nearby. 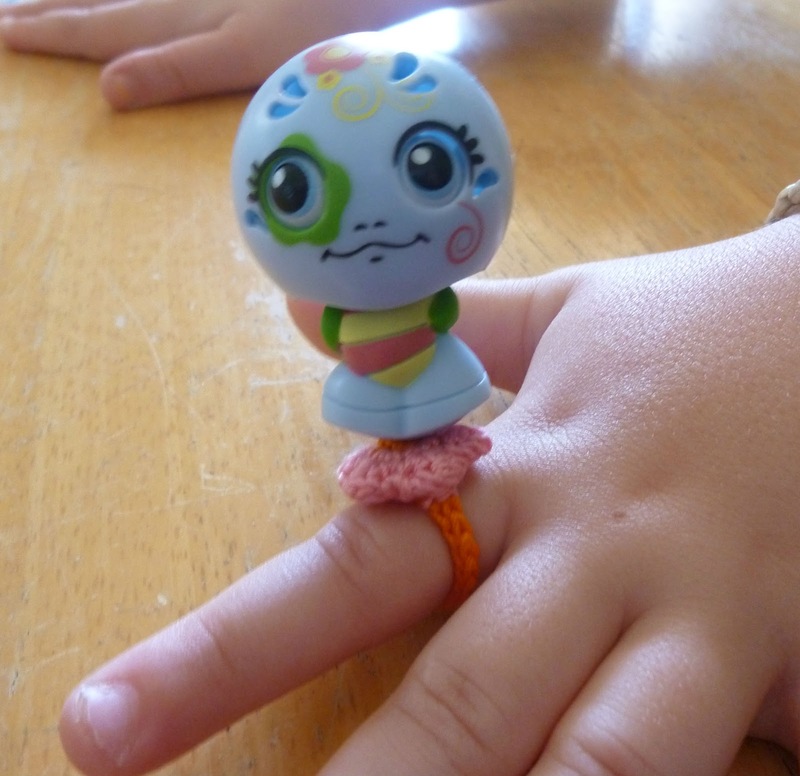 Love the ring with the magnet! So cute! Thanks Mariel!! It is ridiculously small and she wields it mightily! Super powers are awesome! This is exactly what everyone needs to move huge piles of iron filings! The magic is YOU! Yes! We are sooo set if the alien invasion is actually a giant Wooly Willie!!! LOL!!! This is awesome and innovative as well. Just found your blog, you are now my new favorite blogger, love love love your crochet, and your stories. Thanks for sharing. I'm in awe of your awesomeness! Dynamos Know Exactly What They Want! 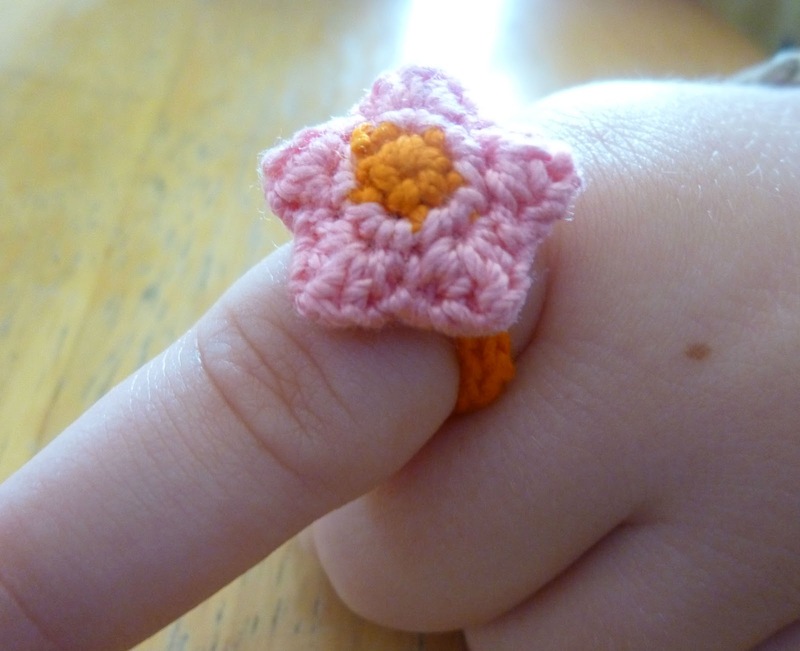 Don't Want To Crochet It Yourself? Buy From a Dynamo! Goin' to the Craft Fair today! Day Five of Soap Dispenser Week 2012! Sites That Are Totally Worth Checking Out!